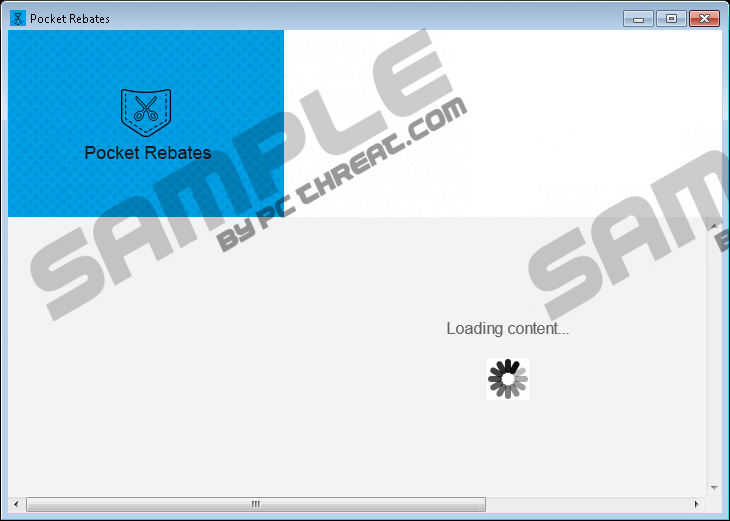 PocketRebates could be a useful application that offers you best deals and coupons while you are shopping online. However, the emphasis is on “could be” because it definitely is not. In fact, we have found that this is a new, useless, ad-supported program that is an identical clone of Diet Interactive, BurstTravel, and Weather Do. If this adware is present on your computer, it may be a sign that other malware infections have also entered your system. This clearly means that when your PC is infected with this adware, you may actually be up against multiple virtual security risks. This program as well as the related infections may introduce you to potentially unreliable third-party advertisements and websites. This kind of exposure can be quite risky since you may end up on a malicious website when engaging with such content. Therefore, we advise you to remove PocketRebates as well as all related malware programs. If there is any decent protection, i.e., security tool installed on your computer, it may be impossible for you to visit the official webpage (PocketRebates.com) of this suspicious program. As a matter of fact, as soon as you press Enter after typing this URL into the address bar, it will be flagged and blocked right away. This is rather suspicious behavior and also not the first time we have seen it. Practically, all the applications in this group have the same kind of webpage. The reason behind this is most probably the executable installer file that is hosted on these pages. Unfortunately, if your computer is not protected, you may be able to download this .exe file. We must warn you that it contains several malware infections, including Search Know, Sweet-page.com, and MyPcBackUp. The quantity and the type of infections seem to be dependent on your region. We have also noticed that these malicious programs may also change with time. But it is quite possible that you have never even visited or heard about this official page and this adware is still on your computer somehow. Let us tell you how it is possible and how this tricky adware can show up uninvited. Research shows that the most likely way for you to get infected with this adware is that you click on a pop-up advertisement, such as a download offer, or you click on modified search results. Both of these cases suggest that there is some kind of malware on your computer already. In the first case, there need to be at least one ad-supported program that is capable of displaying such a corrupt third-party advertisement that drops this adware onto your computer. In the latter case, there has to be a browser hijacker on your PC that can modify search results and inject affiliated parties’ ads and sponsored links. We hope that it is clear now that practically there is no way for this adware to be all alone on your system. That is why we believe it is essential to perform a full-system malware scan after you delete PocketRebates. Somehow this application is surrounded by promotions since even its own webpage seems to host at least two third-party ads, which may be potentially harmful. But when you run this program, it also may open an Internet Explorer window and load questionable advertisements and sites, such as interest6.valuedinformation.com/numbers/?t=5&c1=UAOCD%3A%3A. In addition to that, it launches its own application window with a large logo in the top-left corner and right below it loads different shopping-related websites. However, this program does not seem to have browsing capabilities, which makes it quite useless actually. Why would you not simply use a reputable browser instead to view shopping sites? We do not recommend that you engage with any content coming from this adware because it may result in being taken to potentially harmful websites. If you do not wish to infect your computer with more threats or become an online scam victim, we suggest that you remove PocketRebates as soon as possible. If you are ready to act, we can tell you how you can clean this annoying adware from your PC. It is a very simple thing indeed so even inexperienced computer users can take care of this. You need to locate and use the uninstaller through Control Panel. If this does not ring the bell, you will find our guide below quite helpful. Please keep in mind that this may not be the only threat on your computer. If you want to put an end to this malware invasion situation, we advise you to download and install a reliable malware removal program. If you keep this tool updated regularly, you will have full protection from all known malware infections. Press Win+I and pick Control Panel. Quick & tested solution for PocketRebates removal.